Marine life has become richer in the seawater of Padre Burgos, Southern Leyte six months after 72 bamboo artificial reef modules were launched in the town’s coastal villages. Scaph Pro (Philippines) Oceanographic Research, a French non-government organization has been leading the projects in partnership with local government of Padre Burgos and provincial government of Southern Leyte. Jean Francois Marailhac, a French Oceanographer and Vice President of Scaph Pro, (Philippines) and Michael Levett, a dive operator in Padre Burgos, recently submitted a report to the local government detailing the number of species of fishes, invertebrates and other marine organisms that has since congregated and colonized the artificial reefs. Currently, 146 fish species and 124 species of invertebrates were identified. “The reefs of Padre Burgos are generally healthy. 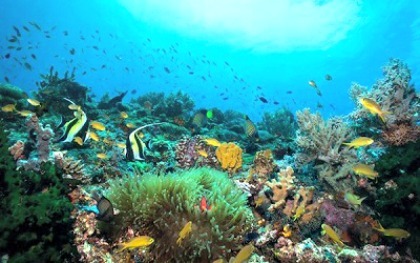 In fact, there are world class dive sites in the area, teeming with fish and amazing marine life,” said Southern Leyte provincial information officer and project in-charge Rio Cahambing. “However, based on our assessment, there are two villages affected with massive coral destruction caused by the destructive fishing method called cerosca similar to muro-ami,” he added. These corals are virtually destroyed because of cerosca, which occurred many years ago and only few of the corals were able to recover. The project is still in its first phase and Scaph Pro Philippines intends to expand the artificial reef area to other areas. The project can also be implemented in other towns in Southern Leyte, according to Cahambing for as long as the local government units are cooperative. In support of the project, Southern Leyte Governor Roger Mercado recently donated bamboos for additional artificial reef modules. “Bamboo is plenty in Southern Leyte. It is also cheap, compared to concrete, or fiberglass. It is also very easy to work with, easy to handle, especially during launching of the module, and above all, eco-friendly,” Cahambing explained. The official added that restoring reefs in the province of Southern Leyte not only have a big impact to tourism, but to the local economy as well. Southern Leyte is known as the diving capital of Eastern Visayas. The abundant marine life of the province has attracted whale sharks hunting for food.